The Lincoln Recruitment Irish Early Career Awards, in association with KBC Bank Ireland, celebrate excellence and recognises the achievements of brilliant young professionals in Ireland, and ultimately, rewards innovation, best practice and outstanding achievement across a broad range of professional sectors. We are delighted to welcome the Belvedere Union Annual Dinner to the Round Room. The National Analytics Conference promises to be the most important analytics event in Ireland in 2018. We have brought together some of the most influential thought leaders in the world today in Analytics, AI and IOT for a fantastic day of insights, discussion and debate. The EPA, as part of the National Dialogue on Climate Action, will host a public lecture on exploring health and climate change with Prof. Hugh Montgomery – Professor of Intensive Care Medicine and Director of the Centre for Human Health & Performance at University College London. The Climate Innovation Summit 2018 programme is intended to make space for truly fresh perspectives on finance while leveraging the innovation capacity of EIT Climate-KIC’s 300-plus partners from across the private and public sectors. We are delighted to host the Gala Dinner for the Climate Innovation Summit on the 7th of November. This year’s event is Looking to the future – your future, your firm’s future and the future of the profession. The aim and objective of this symposium to provide an opportunity for practitioners to update their knowledge in areas of practice management and regulation. The topics are of relevance to those in general practice, in-house and those in specialised firms. The Keynote speaker is Richard Susskind talking on ‘Future Proofing the Legal Profession and the Provision of Legal Services’. The Bolder Board Training teaches boards how to work with their CEOs to create audacious possibilities for impact. It is the first board training designed specifically to offer boards a pragmatic and conscientious alternative to the culture of financial deprivation and constriction that they often find themselves upholding. International author, speaker and trainer Dan Pallotta is to deliver a one-day training programme for Charities Institute Ireland on Monday 12th November 2018. The National University of Ireland is a federal university comprising the largest element of the Irish university system at present. NUI actively promotes, recognises and rewards academic distinction and scholarship at the university level, and assures comparable, high academic standards for degrees and qualifications awarded by NUI. The University proudly undertakes activities to advance higher education, and to contribute to the civic, cultural and intellectual life of Ireland, with a particular commitment to supporting the Irish language and the rich and diverse culture of Ireland. As part of this mission, NUI annually grants Awards (Scholarships, Fellowships and Prizes) to a value of some €1 million to NUI students, graduates, staff and institutions. The annual NUI Awards Ceremony is a special event in NUI’s calendar and the 2018 Ceremony will be held at the Round Room on Tuesday, 13th November 2018. Over 130 awards will be granted to NUI graduates at the ceremony. 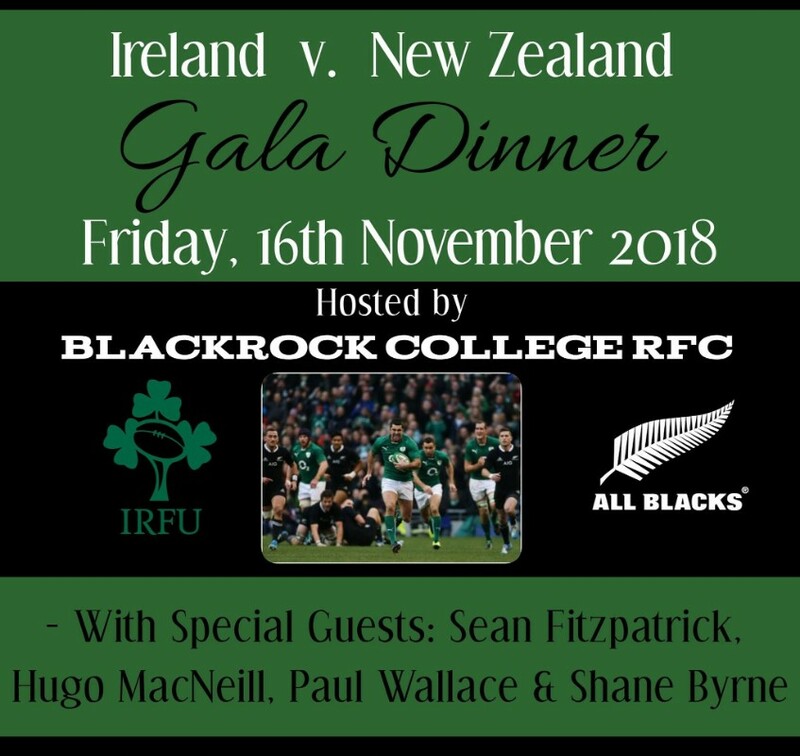 Join Co-operation Ireland in Dublin for a fabulous VIP Reception and Gala Dinner with Martin and Michael O’Neill on Wednesday 14 November 2018 in the Round Room at the Mansion House, prior to the football international between Northern Ireland and the Republic of Ireland taking place at Aviva Stadium on 15 November. The evening will be hosted by Pat Kenny with special guest appearances from Paul Brady and Colm Wilkinson. The awards celebrate the quality of original journalism that makes newsbrands such an indispensable part of Irish daily life. This year there are 26 categories to enter including Columnist, Crime Journalist, Political Story, News Analysis and Digital Excellence, as well as the overall award for NewsBrands Ireland Journalist of the Year. The SFA Annual Lunch is the highlight of the small business calendar. It is an opportunity to celebrate the contribution that small businesses make to the Irish economy and society. This is the perfect opportunity to bring together your invited guests, special customers, clients and valued employees to kick off the festive season. The 26th Technology Ireland Industry Awards celebrate those companies who have achieved exceptional success, developed innovative technologies and partnerships and achieved significant sales results over the past year. This annual flagship event has gained an exceptional reputation as one of the most coveted Award ceremonies within the technology sector both in Ireland and overseas, with over 500 leading influencers and decision makers in the digital & software technology sector in attendance. Experience the unique atmosphere of live discussions with experts, and have your chance to ask them YOUR questions. Four true world-class experts in the world of nutritional sciences will join SNR host Danny Lennon for a day of deep-diving conversations on the most cutting-edge and important topics in nutrition. The Millennial of the Year is a national fundraising competition which in 2018 is aimed at raising €100,000 for Down Syndrome Ireland (DSI). 100 of Ireland’s most promising millennials are challenged to raise at least €1000 in whatever style they wish before the 24th November. Their fundraising events and endeavours will be judged by a committee of 10 Irish celebrities who will be awarding millennials in 10 awards across 5 categories and the awards will be presented on the 24th November at Dublin’s most prestigious private event – The Millennial Ball which is proudly sponsored by Irish Life.